"The Friends of the Tembe Elephants Club"! You will also get a regular email newsletter about latest specials at the lodge, exciting new bird and game sightings, and what’s happening in general at the Tembe Elephant National Park! Visit Tembe for an exclusive African bush experience ! 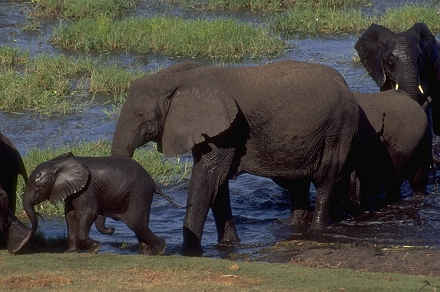 What a privilege to introduce to you the Tembe Elephant National Park - a largely undiscovered African wonderland! Tembe is a fully-stocked Game Park which is rumoured to be one of the wildest reserves left in South Africa with the least human influence. This luxurious safari lodge consists of luxury en-suite tented accommodation. A thatch-sheltered splash pool, and open barbeque are complete the picture. Enjoy tasty meals under the stars - and the dancing flames of the camp fire in the African bush. Modern conference facilities are available for meetings, conferences and team building. Tariff includes all (4) meals per day , coffee bar, and 3 guided game drives on open safari vehicles by expert field guides. Tembe Safaris can arrange return road/air transfers from Durban International Airport / Durban-based hotels to Tembe Elephant National Park for overseas visitors. Tembe has an on-site air strip for fly-in safaris. Read about the latest news from the Tembe Elephant Park. A site solely dedicated to photographs of Elephants. Thank you for your visit. See your on safari!